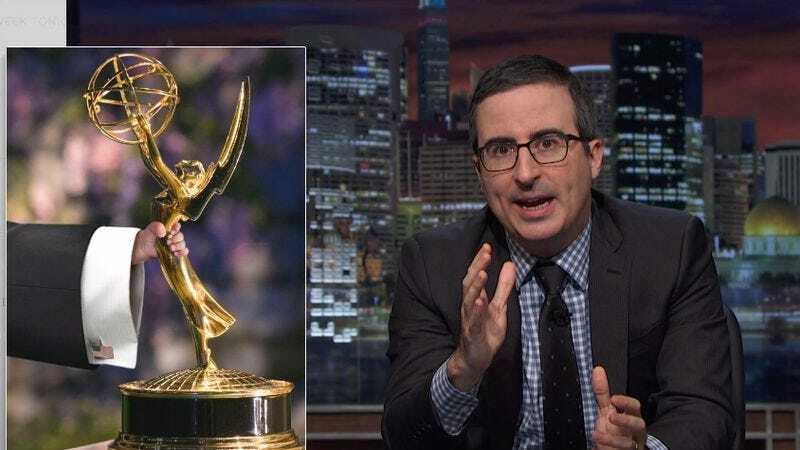 At this year’s Emmys, Last Week Tonight won the award for Outstanding Variety Talk Series, solidifying itself as the heir to The Daily Show’s throne, at least in the heart of Television Academy voters. It also picked up the prize for Outstanding Writing For A Variety Series. Meanwhile, host John Oliver also has some of trophies from his time as a writer on Jon Stewart’s aforementioned program. All this goes to say that Oliver has something Donald Trump doesn’t—aside from, you know, rationality. Trump, naturally, is really bitter he never got an Emmy for The Apprentice, a point which came up during last week’s debate. “Of course he wants an Emmy,” Oliver said on Sunday’s show, “It’s a woman, it’s gold, and it’s proportionate to his tiny hands. It’s basically Trump’s ideal mate.” So Oliver proposed a solution to both Trump’s and the nation’s problem in the form of a bet. “I will take the side you win, you take the side that you lose. That way if you lose, you still win. And as for the stakes of the bet, I have something I know that you want,” he explained, pulling out a gleaming statue. Seems like a pretty good deal, Donald. We’d definitely go for it.